Thanksgiving is the most cooking-intensive time of year. You want to be certain to have all of the essential cooking tools lined up to make your preparation time less complicated and more efficient. The season really is about time spent with family and friends. Good kitchen tools equals less time spent in the kitchen. In terms of prep time, a good peeler will save you lots of time in the kitchen. The type of peeler you use will depend on your own preference. A survey of cooking blogs revealed that most people prefer to have three types of peelers, each with sharp stainless steel blades: a regular peeler, a julienne peeler and a serrated blade peeler for fancier cuts. Every Thanksgiving dinner has a delicious casserole of mashed potatoes on the table. Many families have their own special recipe and although many will swear by their old fashioned potato masher, the potato ricer is a kitchen tool that is well worth trying. It will result in flawless, finely-textured potatoes every time and will cut prep time by half. Some potato ricers have adjustable settings for texture, and you will find that you can use this tool for squash, rutabaga and many other vegetables, or combinations that you want to puree. Not enough can be said about the importance of a cooking thermometer. To rely on the “pop-up” thermometer in the bird is to vote for dry, tasteless, overcooked turkey. In addition, a thermometer is a reliable tool for many other cooking tasks, such as casseroles, pies, and gravies. 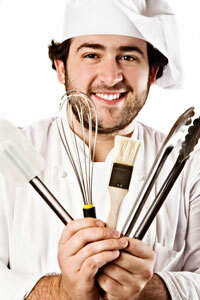 It is best to invest in different cooking thermometers for different cooking tasks. How high tech you want to go is purely a measure of your own preference, but investing enough to have an accurate thermometer for each cooking task is the main purpose. A pastry brush is going to come in handy in a myriad of small tasks on Thanksgiving Day. From basting the turkey, to spreading melted butter on a variety of dishes, to basting the fresh bread with garlic oil; you will want to have a simple wooden brush with natural bristles. This will do the best job of holding whichever substance you are basting and will also clean up easily with hot water and soap. There’s no end to the tasks you will perform on Thanksgiving Day that will require a whisk. From stirring the gravy to fluffing the potatoes, this may be the most used tool of all. Most prefer the traditional bulb-shaped wire head, though there flattened-out and a few prefer this for flattening lumps and quick-whisking gravies. Choose your favorite or keep a handful on call for the many tasks of the day. This relatively new addition to the cook’s arsenal of tools is proving to be indispensable. A turkey fork is about 11 to 12 inches long, 4 inches across, and the tongs are about 6 inches long. With two forks, you can easily lift one large turkey out of its rack and on to the cutting surface. No more wrestling with a bird, wondering if it will get to the plate without falling. These oversized forks are well worth the investment, and they double as carving forks. Not enough can be said about finding the right turkey roaster. It should be stainless steel and have a good rack sturdy enough to solidly rest a turkey the size you normally cook, with room to drain drippings. You can choose one with a lid or one without. If yours does not have a lid you can rely on aluminum foil to make a tent to hold in moisture when needed. Some people prefer a rack with handles; this is not necessary if you invest in the turkey forks mentioned above. In preparing for Thanksgiving, everything that you can do ahead of time means more time with the family. Good casserole dishes can make all the difference. Consider lidded casseroles, at least one, three to four quart size (the equivalent of a 9x13 dish) and at least two, 2 to 3 quart size (the size of an 8x8 or 9x9 inch dish). With casserole dishes on hand, you can prepare potatoes and vegetable side dishes up to a day ahead, saving you hours on the big day. Thanksgiving is really all about spending time with family. Consider the kitchen tools you already own, and whether an upgrade to some of the tools mentioned here might give you some well-earned time out of the kitchen with your loved ones. The tools we’ve mentioned can also improve your presentation and you’ll find your loved ones fawning over your delicious, home-cooked meal.